With Arsenal closing in on the club-record £55.4million signing of Pierre-Emerick Aubameyang from Borussia Dortmund, it looks increasingly likely that Olivier Giroud could conclude the January transfer window at rivals Chelsea. It is well known that Antonio Conte is in the market for another striker this month, with the Blues linked with everyone from Edin Dzeko to Peter Crouch, Andy Carroll and Ashley Barnes. The primary criteria appear to be that the striker is over 6ft tall, capable of heading the ball and willing to serve as back-up to Alvaro Morata. 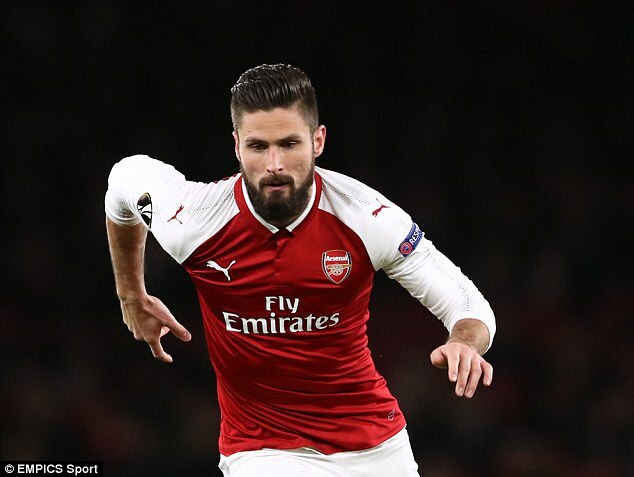 The 31-year-old France international Giroud - who is 6ft 4in - ticks all of those boxes and the Stamford Bridge hierarchy spent the weekend discussing whether to match Arsenal's valuation of £35m before Wednesday night's deadline. With Aubameyang coming in to join Alexandre Lacazette in Arsenal's attacking roster, chances for Giroud, already a bit-part player in the Premier League this season, will become even more limited. There was talk of Giroud going to Borussia Dortmund as a makeweight in the Aubameyang deal but the Frenchman is eager to remain in London, where he has lived since the summer of 2012. Although he would be crossing one of London's football rivalries, it does make sense on many levels for Chelsea to sign Giroud. His goal returns for Arsenal have always been very good and he has a proven track record as a reliable scorer. In his five full seasons at the Emirates Stadium, Giroud has returned 17, 22, 19, 24 and 16 goals in all competitions, helping them win the FA Cup on three occasions if not sustaining a Premier League title bid. Even this season, Giroud has scored seven goals, including four in the Premier League at an average of one every 87 minutes. It's not bad considering he has started just the one Premier League match, coming off the bench 14 times for usually around 20 minutes or so as he plays second fiddle to Lacazette and Arsenal's other attacking options. He would surely have more goals but for the hamstring injury that has kept him sidelined since the 1-0 win over West Ham in the quarter-finals of the EFL Cup. In addition to this reliable scoring record, Giroud's size and strength make him a genuine handful for defenders and that is precisely the physical edge Chelsea are looking for. He can also capably hold the ball up and lay it off to team-mates inside or around the penalty box and Giroud would have no shortage of options given Chelsea's attacking players. This combination of qualities seems to have been far more appreciated by the France coach Didier Deschamps than Arsenal boss Arsene Wenger in the recent past. He starts more reliably for his national team - despite an embarrassment of riches - than for Arsenal and scored eight goals for them last year. In all, Giroud has a decent return of 29 goals in 69 international appearances for France and looks certain to go to the World Cup this summer regardless of his club situation. Indeed, there is an irony that Giroud usually starts ahead of his club-mate Lacazette for the national team, a role reversal of the situation at Arsenal. Another factor in Giroud's favour in the closing days of the January market is that he remains eligible for the Chelsea Champions League squad having only featured in the Europa League with Arsenal this season. Giroud will be well aware that he won't be the first choice striker at Chelsea - they didn't pay an initial £58m for Alvaro Morata last summer for the Spaniard to sit on the bench. But he would certainly be at best the third choice if he remains at Arsenal with Aubameyang coming in, plus he would have the possibility of playing in the Champions League this season and a better chance of being in it next season. Chelsea, unlike Arsenal, also remain in the FA Cup, a competition he has excelled in and where he would have a decent chance of playing in between now and the end of the campaign. Chelsea's first-choice target remains Roma's Edin Dzeko, but talks appear to have stalled over the weekend, so their net may have to be cast elsewhere. Bringing in Giroud could be a decent compromise that suits all parties.